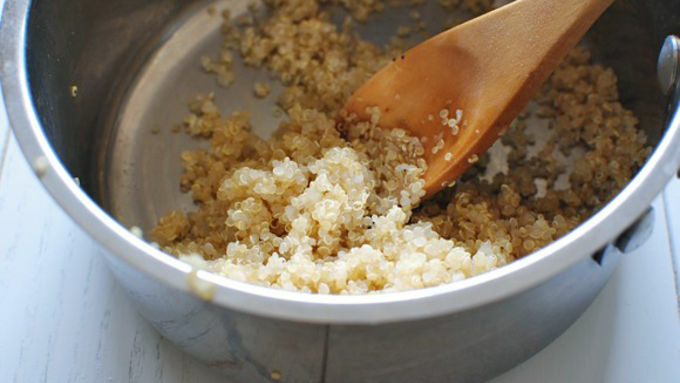 Cook the quinoa in boiling water until little spirals have formed, about 15 minutes. Drain. Heat a tablespoon of the oil in a small sauté pan. 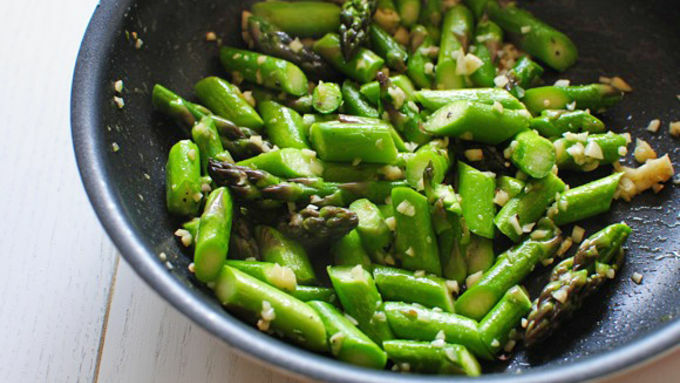 Add the asparagus and sauté until crisp-tender, four minutes. Add the garlic and a pinch of salt and pepper; bloom 30 seconds. 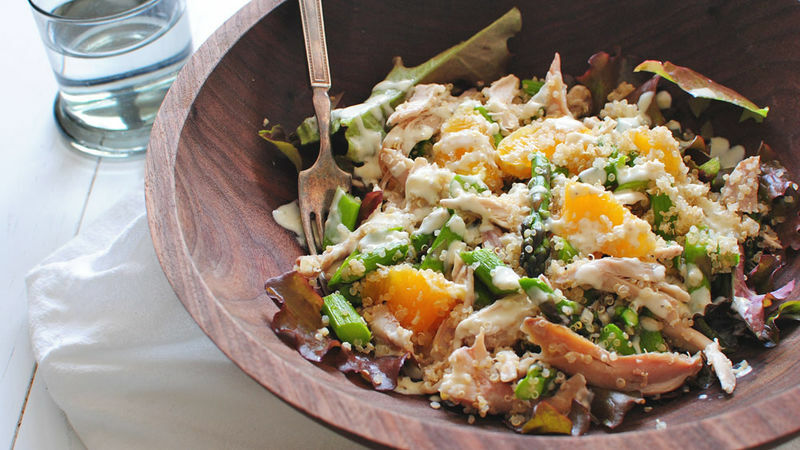 In a large bowl, toss together chicken, cooked quinoa, sautéed asparagus, and tangerine slices. In a smaller bowl, whisk together the yogurt, remaining tangerine juice, and olive oil. Season with salt and pepper. Arrange the salad over a bed of red leaf lettuce (or your favorite greens) and drizzle with the dressing. I feel like chicken and asparagus and tangerine and quinoa tonight. Like chicken and asparagus and tangerine and quinoa tonight. 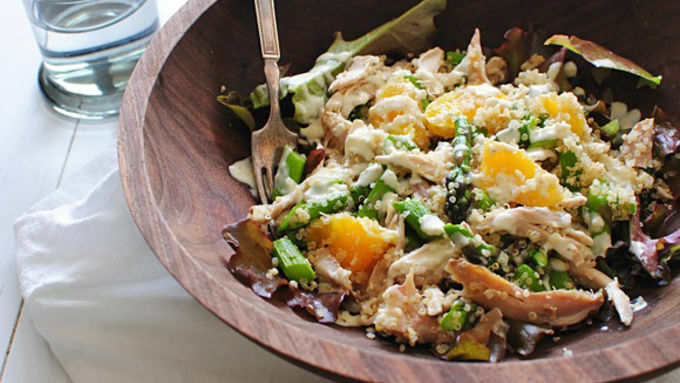 Like chicken and asparagus and tangerine and quinoa TONIGHT! I'm also incredibly sorry to put you through that just now. So this salad is prooooteeeeeeeinnnnnyyyy. Which is awesome. It's like, coming at you from all angles. The chicken, the quinoa, the Greek yogurt, the asparagus. I'm just kidding on the asparagus part. Just had to make sure you were still with me. For this super easy salad just use some leftover shredded chicken, some quinoa, a tangerine (or orange if you can't find a tange! I call it a tange), some Yoplait Greek yogurt, asparagus and some garlic. Oh! And lettuce greens. I went with red leaf lettuce this time. 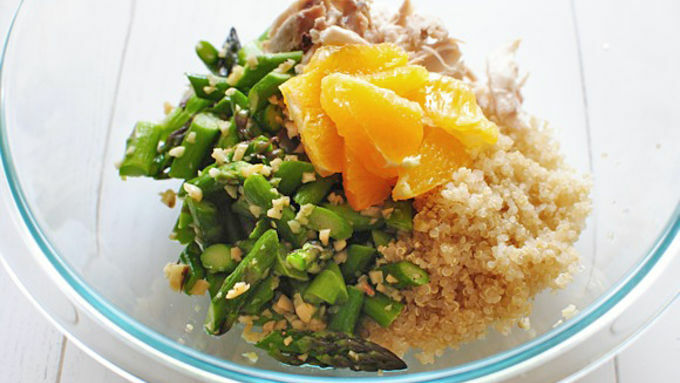 Combine the quinoa, chicken, asparagus and sliced tangerine in a big bowl and toss it all together! Whisk together some of the tangerine juice with the yogurt and olive oil. Easy dressing, baby. Doesn't get any better. And proteiny. And better. And proteiny. And bet… – I'm just joking.